The public focused most closely last week on two interrelated news stories – the nation’s struggling economy and the anti-Wall Street protests that have now spread far beyond their beginnings in New York City. Two-in-ten (20%) say their top story was reports about the condition of the U.S. economy. That’s about the same as the 18% that say their top story was the Occupy Wall Street protests in New York and other cities, according to the latest weekly News Interest Index survey, conducted Oct. 13-16 among 1,007 adults by the Pew Research Center for the People & the Press. One week earlier, the protests did not rank high among the public’s top stories, but as the movement has spread – and coverage has ramped up – so has public interest. Altogether, the various economic news threads also topped coverage, accounting for about a quarter of the newshole, according to a separate analysis by the Pew Research Center’s Project for Excellence in Journalism (PEJ). More than a third of that (10% of all coverage) focused on the anti-Wall Street protests. That’s up from 7% the previous week and just 2% the week before that. News about the debate in Washington over jobs and deficit legislation accounted for 6% of coverage and more general economic news accounted for another 8%. 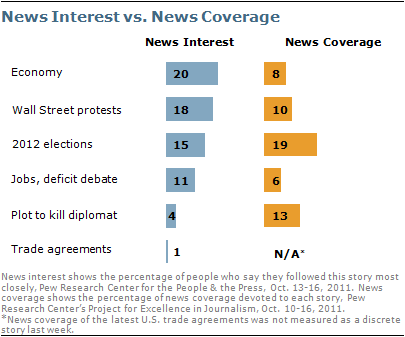 Public interest also was relatively high in news about the candidates for the 2012 presidential election; 15% say the presidential race was their top story. 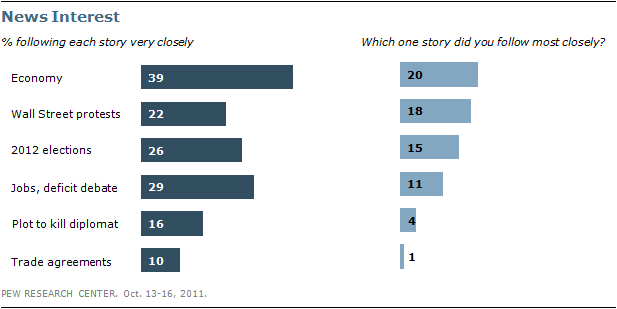 News about the campaign – focused mostly on the top Republican candidates – accounted for 19% of coverage. Among the GOP candidates, businessman Herman Cain’s visibility has surged over the past month, as he has shown increasing strength in national polls and attracted more news coverage. Nearly a quarter of the public (23%) names Cain as the candidate they have heard the most about recently in the news; in mid-September fewer than 1% named Cain as the candidate they had heard the most about. 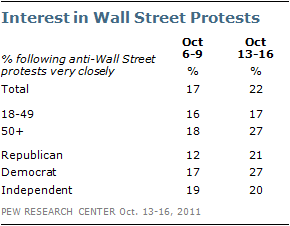 About two-in-ten (22%) say they followed news about the anti-Wall Street protests very closely last week. That’s up from 17% one week earlier, but still less than interest in several of the week’s other top stories. Most notably, 39% say they very closely followed news about the U.S. economy and 29% say they very closely followed the debate in Washington over jobs and the deficit. Currently, 27% of those 50 and older say they followed news about the Occupy Wall Street protests very closely last week. That’s up from 18% one week earlier. Interest among those younger than 50 is essentially unchanged (17% this week, 16% the week before). Interest among both Democrats and Republicans is higher than one week earlier. Currently, 21% of Republicans say they followed news about the protests very closely, up from 12% the previous week. Among Democrats, 27% say they followed this news very closely, up 10 points from 17%. Interest among independents is essentially unchanged (20% this week, 19% last week). Democrats are twice as likely as Republicans to say they followed news about the protests more closely than any other story (24% vs. 12%). Two-in-ten independents (20%) say this was their top story. On the other hand, partisans are equally likely to have named the economy as their top story (21% of Republicans, 20% each of Democrats and independents). In a sign of Cain’s recent surge, about a third (32%) of Republicans and Republican-leaning independents say he is the GOP candidate they have heard most about in the news recently; 20% name Romney. The most heard about candidate in the Republican field has changed repeatedly. In mid-September, Perry was easily the most heard about GOP contender, mentioned by 31% of the public and 44% of Republicans and GOP-leaners. In mid-August, he shared that designation with Michele Bachmann (23% said they had heard most about Bachmann, 22% said Perry). 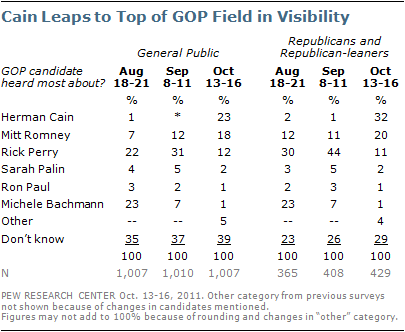 One month before that, Bachmann was by far the most heard about candidate (23% compared to 13% for the next contender, Romney). In April, businessman Donald Trump enjoyed a flurry of publicity as he flirted with the idea of entering the race. That month, 26% said that he was the possible candidate they had heard the most about. Romney was next, mentioned by 9%. In June, speculation built about a possible run by former Alaska Gov. Sarah Palin. While 22% that month said they had heard the most about Romney, a comparable 20% said they had heard the most about Palin. Economic news continued to dominate the public’s interest last week. About four-in-ten (39%) say they followed news about the condition of the economy very closely. Three-in-ten (29%) very closely followed news about the debate in Washington over jobs and deficit legislation intended to boost the economy and 22% say they very closed followed news about the anti-Wall Street protests. About a quarter of the public (26%) followed news about the 2012 elections very closely; 15% say this was the news they followed most closely. Not surprisingly, Republicans continue to show more interest than Democrats or independents. Nearly four-in-ten Republicans (38%) say they followed this news very closely, compared with 23% of Democrats and 22% of independents. Other stories attracted less attention. Fewer than two-in-ten (16%) say they followed news about a plot allegedly orchestrated by Iran to assassinate the Saudi ambassador in Washington; 4% say this was the news they followed most closely. News about Iran, focused mostly on the allegations by the U.S. government about the assassination plot, accounted for 13% of coverage. The passage of three, long-stalled free trade agreements in Congress – with Colombia, South Korea and Panama – attracted little attention from the public. One-in-ten (10%) say they followed this news very closely. Just 1% say this was the news they followed most closely. PEJ did not have a separate measure on the trade agreements. News about the pacts is included in economic news as measured by PEJ. These findings are based on the most recent installment of the weekly News Interest Index, an ongoing project of the Pew Research Center for the People & the Press. The index, building on the Center’s longstanding research into public attentiveness to major news stories, examines news interest as it relates to the news media’s coverage. The weekly survey is conducted in conjunction with The Project for Excellence in Journalism’s News Coverage Index, which monitors the news reported by major newspaper, television, radio and online news outlets on an ongoing basis. In the most recent week, data relating to news coverage were collected Oct. 10-16, and survey data measuring public interest in the top news stories of the week were collected Oct. 13-16 from a nationally representative sample of 1,007 adults.